Can Nudging Help Us Make Better Choices? Nudging, as popularized by Richard Thaler’s book Nudge, is the idea of making a by-default action the preferred choice so you don’t have to think deeply to make a good decision. However the common definition for nudge as, “a slight or gentle push or jog, especially with the elbow,” gives me reason to pause. I don’t like being elbowed, even if it is done gently with good intentions. At first glance, I was intrigued by the possibility of personally crafting my own nudges. The idea of setting up personal reminders using a service like NudgeMail, seemed promising. While potentially useful, NudgeMail reminders aren’t exactly what Richard Thaler means when he talks about nudging. 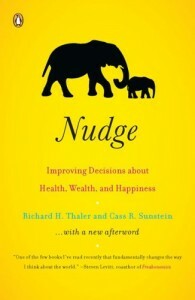 A Thaler nudge is more like an unobtrusive force that moves you to make a better decision or action without feeling poked or prodded. A nudge isn’t the same as a reminder. Successful nudges need to be unavoidable attractive shiny attractions that draw you to nearly effortlessly make good decisions or take appropriate action. They are the not prods, nags, or scoldings, either. You can’t be nudged when you are annoyed. In today’s Oregonian there was an article about the use of electric car charging stations. The idea behind installing publicly accessible recharging stations was to “nudge” more people to buy and drive electric cars. By plunking public charging stations all over the place, the thinking went, people wouldn’t be so concerned about draining their batteries while out and about. 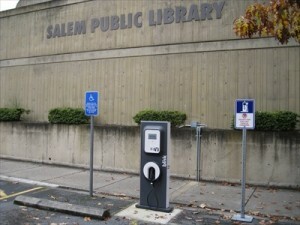 Public charging stations has been in failure in Oregon. Even though placed in public places, chargers are rarely used. Some appear conveniently located (like parking garages in downtown Portland). But many others are located in out of the way places (there’s one at the back end of a shopping mall near in the small town where I live. I’ve never seen a car there). Turns out they were located more as matter of political expediency than common sense or practicality. Inconveniently, it also takes hours, not minutes, to recharge a car using them. Consequently, people find it cheaper and more convenient to plug in and recharge their cars at home overnight. They don’t need to top off their battery’s charge while working out at the gym. Often people buy electric cars with the intention of using them only for short commuter trips. They don’t need or want public charging stations. But consider the case of Tesla. Tesla has strategically installed fast-charge station capable of delivering up to 50% battery capacity to their sporty cars in about 20 minutes (roughly 16 times faster than most public charging stations). Tesla wants its customers to feel comfortable driving their electric cars on longer trips. There’s a Tesla recharging station by the Burgerville in Centralia, Washington, halfway between Seattle and Portland. Tesla owners are more likely to travel between Portland and Seattle, a distance of 180 miles, if they can stop for a burger at the healthy, local food-sourced burger joint halfway on their journey and get their battery charged at the same time. Tesla has found the right nudge to encourage longer road trips. The idea of painless nudges that help us “do the right thing” seems compelling. But isn’t easy to find subtle nudges for behaviors we want to change. Merely speculating on what might be a good nudge before you implement it can be a bad idea. You need to experiment. I’m not so sure government policy-makers can or do take the time to experiment on the effectiveness of nudges before they implement them. Perhaps they should. On a personal level, any nudge I put in place has to be cost effective, cheap to set up, and easy to tinker with. For example, buying fresh fruit (for me, anyways) is just the nudge I need to eat fruit instead of more sugary snacks. If you don’t like fresh fruit, this nudge won’t work for you. Keeping a tab in my browser open to Duolingo, where I’m trying to learn Portuguese, is just enough of a nudge for to keep me to keep at it. I study for a few minutes every day when I need to take a break from work. And Duolingo gently sends me email reminders about keeping up my daily streak. Still relatively new to Duolingo, these reminders aren’t yet annoying. Overtime, I know they will be. I don’t like to be reminded to do what I’m already doing. I just hope they have a way to turn them off. If motivated, I can be nudged a little. But I’ve got to be in the right mood and it has to be in an appropriate situation and context. If a nudge feels at all like a shove or a poke instead of gentle, painless, helpful guidance, I’m inclined rebel and do the opposite. A classic example of “nudging” by policy makers is to create incentives (think tax breaks or credits). For example, giving a rebate upon buying energy efficient appliances or solar panels. That nudge has been in place for some time here in Oregon. But I haven’t bought a new energy efficient appliance simply to get a tax break. Even if the investment will be paid back in a few years in savings on my electric bill. That nudge was more likely to nudge people moving into a new home instead of someone like me. A couple of years ago, I recycled an old refrigerator because I happened to stumble upon an extremely attractive nudge when I was searching the Internet for recycling options. I could schedule an appointment online (selecting the day and time from a list of available times) for someone to come to my house, cart away my fridge, and mail me a $50 refund check. I was in the right frame of mind for that nudge. The conveniences plus the small monetary compensation made this a perfect nudge. But it is oh so easy to resist a nudge when I am at all forced to think even a little. I am a cranky contrarian who doesn’t like pushy nudges. Don’t tell me I have to recycle my used appliances. And don’t give me too many options to choose from, either. But give me a choice. Nudges should be easy peasy, transparent, painless offerings of ideal options. If you are a policy maker at your company, you might be able establish a few nudges like providing free bus passes to encourage mass transit use or putting in showers to encourage bicycling to work or exercise. If you are an agile coach or team leader you can nudge a little, too. Want to limit the time of a daily standup meeting? Hold it around a whiteboard and have people actually stand up. In my experience, getting comfy around a table makes meetings last longer. But watch out. I know some people who happily spend hours talking at the whiteboard. Every day. They need more than a nudge to keep stand ups brief. This leads some agile coaches to introduce protocols or standard ways of doing things that are demonstrated, and then gently enforced in order to encourage appropriate actions. How I feel about protocols and rituals is the topic for another blog post. Nudging isn’t social engineering for social engineering’s sake, but with the intent of setting up your environment and context so you want to make the obvious better choice without feeling pressured. Have you found effective ways to nudge yourself and change you or your team’s habits? If so, I’d like to hear from you. This entry was posted in Analysis, Books, Psychology by Rebecca. Bookmark the permalink. Those leading the change just need a bullet point in their resume for the next career assignment. There is no viability or data being provided for the profile of the need of the customers. Not saying it is necessarily the case here, it could have been done with the best intentions or not, but there was no validation ofr the intended audience, or customers. – ‘What are their needs?’ would be a basic one to be expanded on. – What is the flow of process we are attempting to meet? – Are the customers asking for this service? – If they are have they been consulted to understand their day-to-day patterns for the service being provided? – If partially meeting the need how much would be good enough? I am sure there are several more questions that could be asked, but this gives an idea and would flush out any bad or not well thought through ideas being proposed. Yep…you make good points, Tom. Nudging to make people make smart choices was the topic of this post, but certainly the case could be made that there should have been some assessment of meeting real needs and supporting people’s ways of driving their electric cars. Even if we are making “nudging” experiments, we can still ask these kinds of questions (and more) before making such commitments.